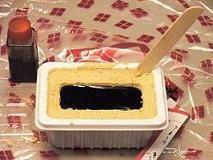 This is “Shingen Mochi (信玄餅)”, one of my favorite treats. Shingen Takeda (武田信玄, 1521-1573) was the heroic territorial lord of the province of Kai (modern Yamanashi Prefecture). Mochi is rice cake. 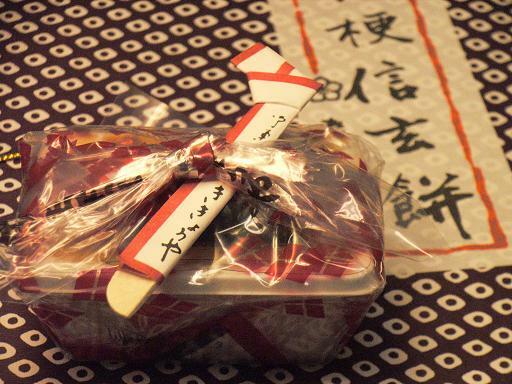 Shingen Mochi is the best-known souvenir from Yamanashi. Metaphorically speaking, it’s like ‘Napoleon pie, souvenir from Corsica’ thing. Opening up a plastic sheet, removing a little lid and plastic container of syrup and then putting the syrup on soybean flour, I come within an inch of eating. I carefully mix the syrup, flour and little three pieces of rice cakes settled in the bottom using a little wooden paddle provided in the mochi kit. As for this kit, I’d say there's nothing that could be improved. I cannot count how many times I ate Shingen Mochi, but I’m always deeply impressed by the common treats. The plastic sheet is not just a wrapper, but it also serves as a mat because soybean flour is easily spilling over. The little pocket of the flour pressed by the lid and container is absolutely essential for putting sticky liquid on powder. The paddle naturally serves as a fork when eating the mochi. It’s standard originality and ingenuity in Japan that manufactures make all kinds of efforts for costumers. 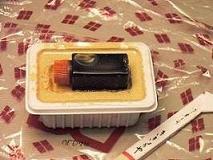 Japanese, including me, are accustomed to the standard, so when we are out of the country, we sometimes feel disappointed with each and every local commodity. 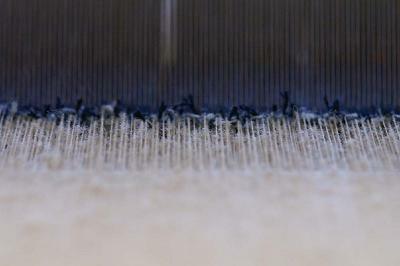 This shawl is a piece of work rather than just a textile product. 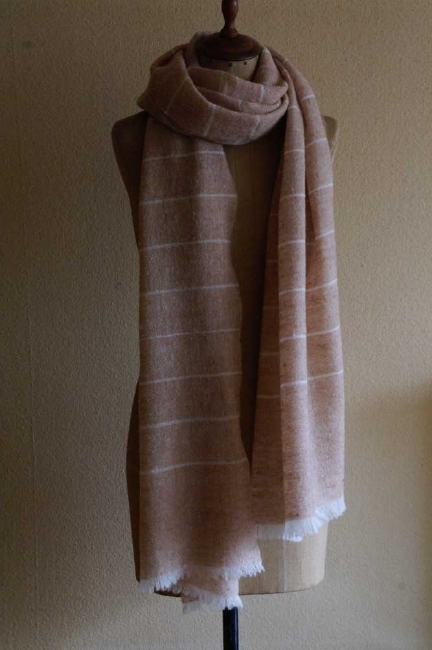 A creator of the shawl is Mariko Takesaki (竹崎万梨子). She has been working for many years as a product coordinator in the high-fashion industry. For several years, her work has centered on the creative activity. 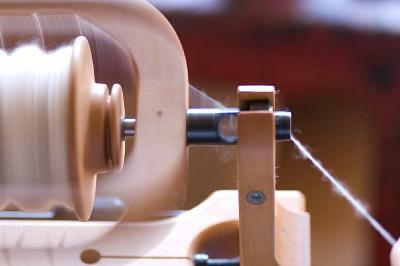 All items are manually produced. Takesaki washes and dyes raw wool imported from England, then spins a yarn and weaves shawls in her home and studio in central Tokyo. Her pieces of work are absolutely great in both taste and quality. You are lucky if you see something you like and can get that item when she is holding a private exhibition. Otherwise you will have to order and have a long waiting time (2-3 months or more) for your order to arrive. However, I think it is a worthwhile option to order an item because the creator with a distinctive fashion sense makes only one item in the world for you. I actually ordered a shawl, and I am quite pleased with that. Do you have plans to come to Tokyo sometime soon? 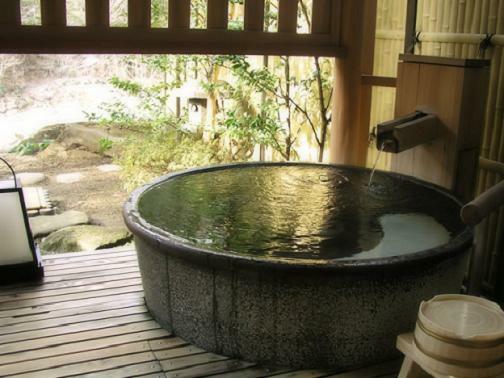 If you’ll not be able to take a stay-over trip to Onsen (温泉: hot spring resorts) because of a tight schedule, in Tokyo there are plenty of places where you can feel like you are visiting real Onsen. That’s half a day of free time you need. Just bring yourself. I visited a number of day spas in and around the Tokyo metropolitan area. I pick up two treasured spas among them. You can reach them within 1-hour form main part of Tokyo. The nearest station is Chofu (Keio Line). Feature: It’s nice and cozy with Japanese Ryokan flavor. The indoor bathing area is not so spacious but comfortable. There are 5 unique bathtubs in open air space: a tub inside the cave, a wooden tab, a tub surrounded by rocks, a tub in a hexagonal hut and so on. I like the tub in the hut! 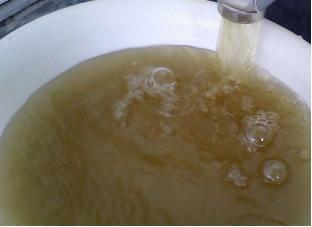 Tip: The hot spring water is deep brown, which contains ancient maritime component. Feature: It’s surrounded by greenery, so when I was sitting in the outdoor bathtub, I felt as if I was in distant Onsen. There are three different types of sauna: dry, steam and mist. Nice! Not only the bathing area, there are a pool and outdoor Jacuzzis (bathing suit required). Tip: Various massages and treatments are available. For general bath manner information, David Kawabata’ Site is helpful. I’ll present another day spas some other time. 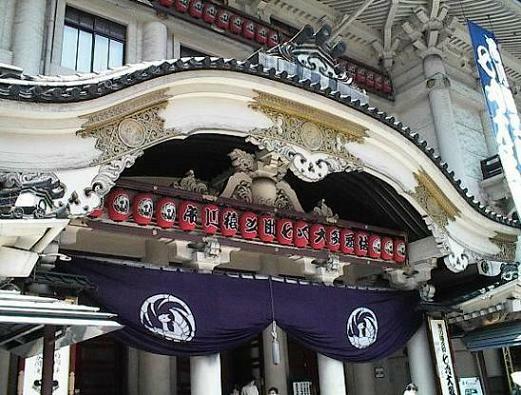 Kabuki-Za Theater in Ginza will be closed next month for the theater’s site redevelopment. The present building was originally built in 1924, and then it was destroyed as the result of an air raid on Tokyo by US in May 1945 and restored in 1950. I see Kabuki dramas once or twice a year in a Makumi seat on the 4th floor most of the time. “Makumi (幕見: single show viewing)” is convenient for people who have no time to see the whole program consisting of three or four separate shows, and it’s unique system to Kabuki-Za Theater. I just go there and buy a ticket at the door when I feel up to it. Now I’m the only one who regularly (though not frequently) sees Kabuki among my immediate relatives. Few years ago one of my aunts told me that my grandma used to see it in a Makumi seat without telling family when she went shopping alone in Ginza. I lost her when I was thirteen. I’ve been happy to realize that my grandma enjoyed Kabuki at the same Makumi seats since I heard that. According to a Kabuki-za company's press release the present building will be demolished and rebuilt into a new 29-story building consisting of the theater on lower floors, which will open in the spring of 2013. I guess I'll miss not only the building but also my grandma again. 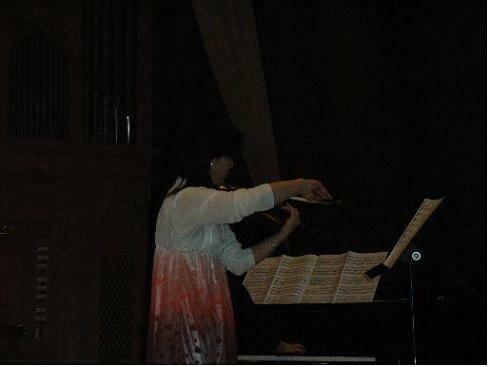 My sister performed at the violin recital the other day. It’s her hobby. She’s taken lessons for 17 years. People who are learning to play violin form the same violinist (including her) appeared on the stage that day. I go to this once-yearly recital every time. When she began her lessons, many children performed at it. It was a lot of fun to follow the development of little kids. However, over the last five or six years, two thirds of the participants are adults. Now I’m following them. I feel the adult learners have commonalities: they love classical music and have an ideal how to perform the music. Their ideal might be their favorite violinist’s performance. Some of the adults learned to play violin as a child, and others didn’t. In either case they can’t play it as they wish. The ideal seems a long way to go right now, but they’re steadily progressing! Housewives whose children grow older, office workers and retired businessmen happily play the violin in public. I'll be rooting for them. Rakugo is less well known among foreign people than “kabuki (歌舞伎: traditional drama performed by male actors)” and “bunraku (文楽: Japanese traditional puppet play). Unlike those performing arts, it’s difficult to provide prepared English subtitles or voice guidance of rakugo to a foreign audience especially in yose (a rakugo theater). In yose many rakugo-kas (落語家: rakugo performers) appear on stage a day, and they decide which story they would tell on site by checking previous performers’ stories and observing an audience form the stage. Japanese who aren’t familiar with rakugo sometimes asks me how he or she can enjoy it. As far as I’m concerned, regardless of one’s nationality, if you understand daily Japanese, can picture a scene by reading a fiction and have an ability to sympathize with characters in a novel or drama, you’ve been ready for rakugo! Trust me. Even if you can’t understand some old-fashioned words and expressions in the Edo period, you can guess them in context of a story and follow a plot. 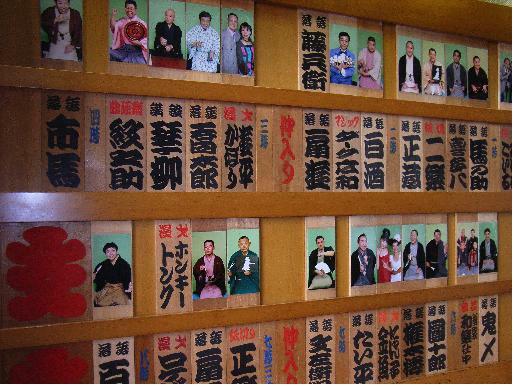 Then a rakugo-ka will take you to the world of rakugo stories. 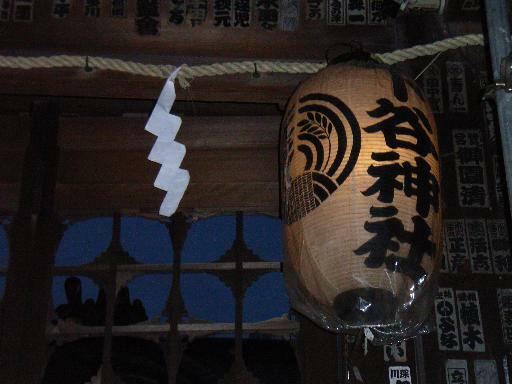 I got the ticket as a gift and went to Shitaya Shrine (下谷神社) where the rakugo event was held on Thursday evening. The shrine is in Inaricho (稲荷町) near Ueno and famous for the birthplace of yose (a rakugo theater). It’s said that in 1798 the first performance facilities for rakugo were established inside the shrine grounds. 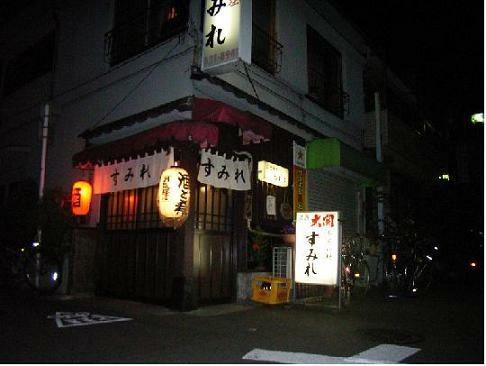 Until then, rakugo was performed on a street or in a rented place. In 2010 the venue was a large hall on the second floor of the shrine office. The photo above shows the stage in the hall. The main performer was Ichiba (柳亭市馬, 1961-, his photo and introduction on Rakugo Association’ HP), a well-qualified mid-career performer, and the others were his apprentices. Ichiba told 2 stories that night. I’m going to introduce a digest of one of them. A rakugo performer plays 5 characters in this story through throwing his voice, changing in pitch and tone, and using gestures. A good performer like Ichiba makes us imagine and picture scenes by telling a story. Well, I hope you feel just a little bit the atmosphere of rakugo! I played hooky and went to “yose” in Ueno to hear “rakugo” last Tuesday afternoon after so long. I enjoyed it with a nice cold beer in my hand. “Rakugo (落語)” is Japanese style comedy monologue, the telling of long humorous stories, mainly in the form of dialogs. It dates back to the late 17th century during the Edo Period. 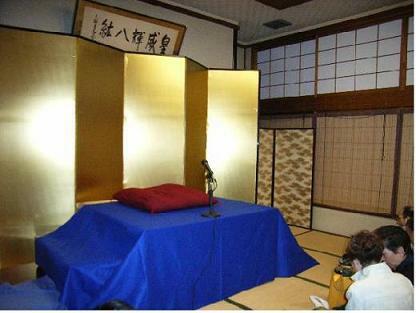 A rakugo performer (落語家,噺家) kneels on a cushion wearing a kimono, uses only a paper fan (扇子) and a small cloth (手拭), and depicts a story by playing multiple characters in it, so the audience can visualize the people in the scene. 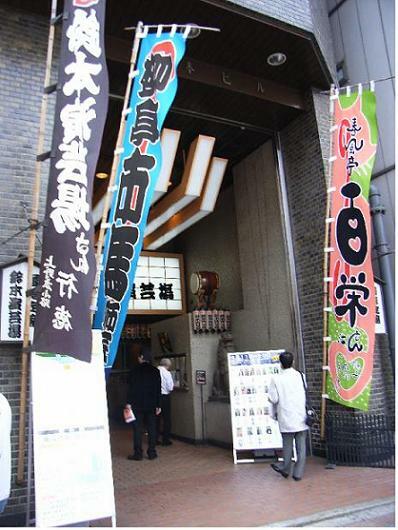 “Yose (寄席)” is a theater exclusively for rakugo. There were many yoses in Tokyo (over 700 theaters in the Edo Preiod! ), but now the permanent theaters are only four in Ueno, Asakusa, Shinjuku, and Ikebukuro. Dr. Wikipedia details rakugo in English. I love this Japanese verbal entertainment. Rakugo was popular among people of all ages until the 1960s or 1970s, but today, except maniac fans many of the audience is older people. I lived with my grandparent when I was a child and watched a lot of traditional Japanese performing arts like rakugo on TV with them. I dropped into my friend’s izakaya (see Definition of Shitamachi 2010.04.11) after the rakugo. I happened to see one of the regulars there and told him about the afternoon. He said he bought a ticket of a rakugo event that’d be held on Thursday but wouldn’t be able to go because of another engagement. Luckily, I got his ticket and went to hear rakugo two days after! From next time, I’ll write articles about the event, “rakugo” and “rakugo stories”. This is my own sakura (a cherry tree). About half of the blossoms are in bloom now. What a cool story! What a cool granddad! I saw him on the TV few years ago and heard the story, and then I chose this double-flowered cherry tree though it’s not autochthonous. On my everyday route to a subway station, it’s the only one sakura tree other than Yoshino cherry (the most popular one in present-day Japan). Double-flowered cherry is later in blooming than Yoshino cherry, so mine blooms alone about this time of the year when people in Tokyo are starting to forget the cherry blossoms. I'll just have to keep working like my tree. Why don’t you find your own tree? I think any kind of tree could be yours. I found the same (more detailed) story in Japanese on Diners Card’s site and information about him in both Japanese and English on World Wide Fund for Nature’s site. I stopped at an “izakaya” (Japanese style pub) run by my best friend and her mom last night. The photo shows its façade. The regular customers are people living in the neighborhood. I know many of them, and it’s one of the handful places where I can go get a drink alone. The place is located at the east end of Bunkyo ward near Ueno and Asakusa. This town is called “shitamachi (下町)” and popular for visiters who explore it and enjoy atmosphere of a traditional Tokyo community. The word shitamachi is explained as ‘a low-lying area of a city with small independent shops and factories, particularly the area of eastern dountown Tokyo near Tokyo Bay’ in a Japanese-English dictionary. Aha…. 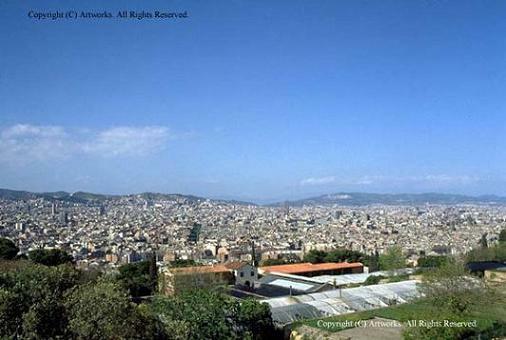 I’m surprised because I expected that it just said a dountown or an old town. But, sorry. The difinition of shitamachi is different in MY dictinary. As far as I'm concerned, it should inherit characteristics from a vigorous popular culture of “Edo” (Tokyo was called it in the Edo Priod: 1603?1868). I call districts that meet the following conditions shitamachi. 1. A district was included in the “Edo Bugyo”(an executive and judiciary branch in the Priod) administrative area. 2. It was a tenement district where ordinary townspeople engage in trading, manufacturing, selling and service businesses lived in the Priod. 3. It is still residential district that has a community association. According to my criterion, shitamach is relatively-narrow and limited compared with the Japanese-English dictionary’s one. For example, some districts along Tokyo Bay are excluded because they are manmade land after the period. Also the outlying area of eastern Tokyo is excluded because it was a rural zone at that time. The town where my friend’s place is located meets all conditions. I’d say in satisfactory districts like it we can get a sense of cultures, human events and people's relationships remaining from the Edo Priod. I know many Edo-style episodes of the regulars, and I’d like to write about them another time. The local people there are really interesting, and talking with them is a kind of cross-cultural experiences even for me, a Japanese living in the other area called “yamanote” that contrasts strongly with shitamachi. 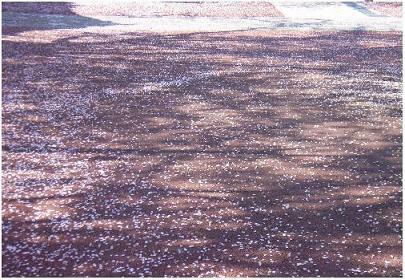 Now, the falling cherry blossom petals flutter down like snowflakes in Tokyo. That's my favorite sight in spring. Somewhere down the line, I always remember the most famous Saigyo’s Waka poem from the sight. “Saigyo” (1118?1190) was born of a clan that dominated Japanese politics during the Heian period and became a Buddhist monk at age of 23. I wish to die under the cherry blossoms in spring, around the time of full moon of February. 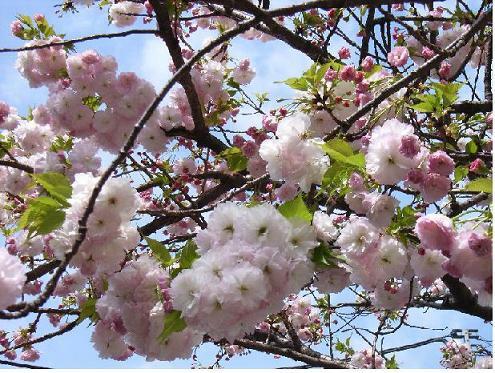 Saigyo wrote just the flower (not the cherry blossoms), but in Heial period it meant a cherry tree or cherry blossoms. The time of full moon of February meant the anniversary of the death of Buddha, ‘February 15th in the lunar calendar’. ‘February 15th’ was March 30th (2010), March 11th (2009), and March 22nd (2008) in a new calendar. Sometimes it would be the beginning of March or April. Thus it isn’t so easy to see cherry trees in full bloom on ‘February 15th‘. He wished to die around the same time as the Buddha’s anniversary under the petals fluttering down. Did he get his desire? He passed away on ‘February 16th‘ (just perfect!) in1190. The day was March 30th in a new calendar, so I hope he made it. The poem was about Saigyo’s conception of life and death. The way its petals fall while still at the height of their beauty was often associated with Samurai aesthetics at the point of death. However, traditionally speaking, I think, the relationships between the cherry blossoms and death came from the conception like this - living and dying in perfect harmony with nature. Many modern Japanese feel empathy for the conception if it seems like we are just partying loudly under the cherry blossoms. For me the appearance of Carmen was Maria Callas, the greatest opera diva for a long time. I’ve never actually seen her playing it, but I used to hear her Carmen a lot - Georges Prêtre / Orchestre de l'Opéra national de Paris in 1964. Here is her portrait on The Maria Callas Official Web Site. However, my Carmen is changing form the diva to the 20-year-old figure skater from Georgia, Gedevanishvili nicknamed Geteko-chan. When her LP at Vancouver Olympics started, I was thinking, “If Carmen existed, she would be just like this skater”. At that moment, a colorcaster on TV said just what I thought. The heroine is one of popular themes for programs, and I see at least two Carmens every year. However, it was first time for me to feel this way. Here is her photo on HP of a Japanese sport paper. Look at Geteko-chan. She is young, plump, solid and attractive. Harsh Wild and Sensual. Come to think of it, the heroine should not be too sophisticated like Callas. In the original novel by Prosper Merimee when a teller, a male traveler who studied the history (the novel was narrated from his standpoint) first met Carmen, she wore a coarse black dress after bathing in a river. Geteko-chan is the most compelling and believable Carmen I’ve ever seen. As we all know Midori is a Japan's proud former figure skater: the World Champion (1989), the Olympic silver medallist (1992). She is the first female skater who landed a triple/triple jump combination and a triple axel in competitions. I haven’t seen the pioneer on TV, in magazines, and in newspapers at all for nearly half a year. I was looking forward to hear her comments on Mao’s triple axels at the Vancouver Olympics, but mass media DIDN’T EVEN SAY HER NAME. I got a rumor that may or may not be true: she’s deprived of any chance to appear on television because she voiced forthright views on the skater or she had problems with her former management company. I often think about her lately along with Mao Asada. To express my feeling I’d like to write a letter to her. I heard you got remarried in last September. Congratulations! I wish I could read your blog, but it remains closed. How are you? I feel you are deeply distressed by circumstances surrounding Mao. So am I. The poor girl has been blamed and derogated from her honor these few years: domestic media that keep contrasting her with the skater, biased coverage playing up her like a one-trick pony, heartless people misled by the media, and much more that I refrain from mentioning. I remember you had been, too. Your fan girl is really super! I think you are most exited about her skating. She has been able to combine jumps, spirals, spins, and steps at a high level. I hope she’ll find a harmonious style of these elements and enjoy bringing out her expressiveness. Beside Mao, we have excellent male and female skaters. Don’t you think it likes a dream come true? I know you always joined in competitions alone and paved the way for them. I'm proud of you no matter what. Oh, I saw your video at Prince Ice World 2009 on You Tube. I was so excited and impressed just to see you on the ice. You couldn’t land a double axel, but it was nice try! At last, I have one complaint. Because I came of age on your jumps, I've been hardly satisfied with female jumps since you retired. You are one and only best.